Heidi Potter is an internationally known and respected Trainer, Clinician, Instructor and Author, sharing over 50 years of horse experience. Her teaching and training is strongly influenced by her practice in traditional Eastern Martial Arts. She is a Centered Riding© Clinician, Holistic Horsemanship Trainer, CHA (Certified Horsemanship Association) Master Instructor/Clinic Instructor, and a Senior Horse Speak™ Instructor. Heidi feels blessed to have learned directly from her neighboring friend, mentor and the founder of Centered Riding, Ms. Sally Swift. Sally’s work beautifully and effectively blends Heidi’s experience with Eastern philosophies into her horsemanship practice. The Centered Riding basics of Soft Eyes, Breathing, Centering and Balance, along with Grounding and Awareness, lead to amazing results both, on the ground and in the saddle. 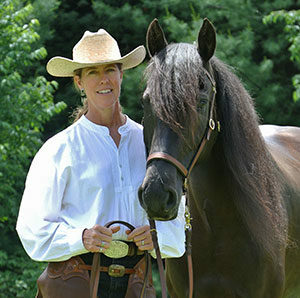 Heidi’s Holistic Horsemanship approach to training evolved from her education in Natural Horsemanship. She was driven by her desire to improve behaviors, safely create boundaries, earn mutual respect and establish connection, all while focusing on enrichment, for both horses and humans. Through teaching clinics she has helped people across the globe build safer, more trusting, respectful and enjoyable partnerships with their equine friends. In March of 2017 she began working with Sharon Wilsie, founder and author of the book, Horse Speak, The Equine-Human Translation Guide and Horses In Translation. Sharon’s step-by-step equine translation program has opened new doors for horse owners, trainers, instructors, rescue horse operations and those in the equine therapy profession. In late 2018 Heidi joined Sharon and Laura Wilsie to form the Horse Speak Educational Program. Visit HorseSpeakEducation.com to learn more.